Come along and learn how to craft your very own heart, which you can give to that special someone or keep! 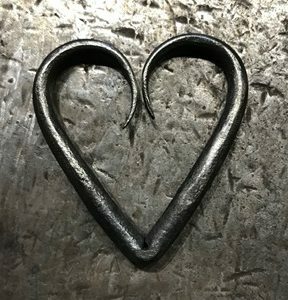 You will have a one-on-one session with our talented blacksmiths from Chain Bridge Forge. The sessions are suitable for those aged 14 years and over, and will entitle the ticket holder to free admission on the farm, so come prepared to explore all we have to offer at Sacrewell! Craft your very own heart in our half-hour workshop for £15. The workshops offer one-to-one tuition so only one person can be booked on per session. If you’d like to book a place for more than one person, make sure you only select one ticket and follow the process through, and then click ‘continue shopping’ to book another session. Your session will entitle the ticket holder to free admission on the farm, so come prepared to explore all we have to offer at Sacrewell!